Jakarta – Continuing the excitement in supporting the Asia sport event, Asian Games 2018, held from 18th of August 2018 until 2nd of September 2018, Toyota Indonesia return to show their enthusiasm and devotion towards sports by supporting the Asian sport event for athletes with disabilities, the Indonesia Asian Para Games 2018, which was held from the 6th until 13th of October 2018, in Jakarta, Indonesia. Toyota Indonesia’s initiative in supporting Indonesia Asian Para Games was proved by attending and watching the matches from several kinds of sport branch and becoming the Official Supporting Sponsor by bringing the “Toyota Berbagi (Bersama Membangun Indonesia) / Together Building Indonesia” spirit to the sport event. This was done to support Indonesia as the first Southeast Asian country to host the Asian Para Games, to support the participating athletes (especially athletes from Indonesia), and also to spread the “Start Your Impossible” spirit. In the Indonesia Asian Para Games 2018, Toyota Indonesia attend and watch the match from 6 (six) sport branches such as Archery, Badminton, Cycling, Para Athletic, Para Swimming, and Wheelchair Basketball, together with many members and their families, the students of Toyota Indonesia Academy (TIA), students of SMK (SMKN1 Karawang, SMK Texar Karawang, SMK Bina Karya 2 Karawang), several university students (from Indonesia University, Gadjah Mada University, Indraprasta University, Bakrie University), and also friends with disability from Wheelchairs And Friendship of Central Asia Indonesia (WAFCAI). Toyota Indonesia’s initiative to participate in Indonesia Asian Para Games 2018 sport event is Toyota’s form of support in order for Indonesia Asian Para Games to proceed successfully and rousing. “I would like to say thank you so much to Toyota Indonesia. Being able to watch the matches of Asian Para Games, makes us feel more grateful and also pushing our motivation to do greater things which feel like impossible.” – Sukheri, Purchasing Division, Toyota Motor Manufacturing Indonesia. “I’m very happy to witness the athletes even with their limitations, they still be able to fight and did their best. So proud of them! 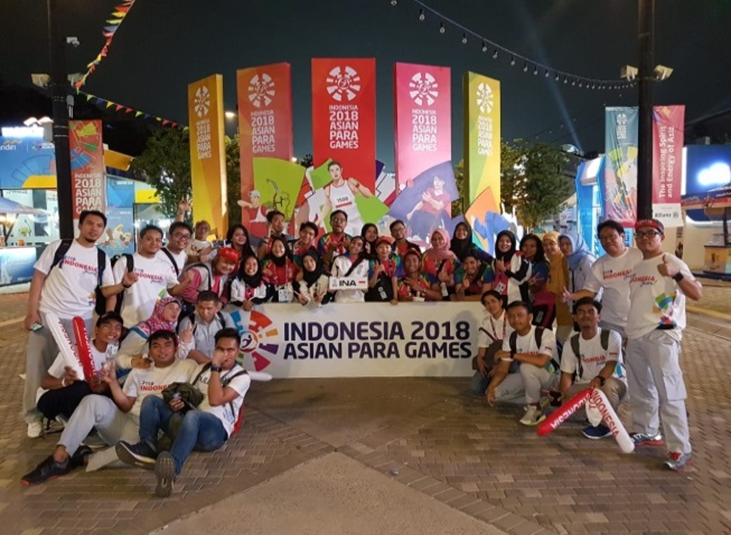 Thank you so much to Toyota Indonesia for giving the chance to watch Asian Para Games freely.” – Maryam, Students of Economy Faculty, Universitas Indonesia.